If you want to see a Doctor this weekend in Toronto, you have two choices. You could pay $100 to get a photo and a few seconds with the 11th Doctor Matt Smith. Or you can head down to artists alley on Saturday and you can hang with Andrew ‘the cool beans Doctor’ Chalmers as much as you want. You heard right, the Dark Journey Doctor and the other good folks from amaudiomedia.com will be letting it all hang out on Saturday in Toronto. Not only will they be on hand to meet and greet with Doctor Who fans, the guys will also be recording a special podcast for Gallifrey Stands on site! Do you like free stuff? Yeah? Well they will also be handing out some promotional goodies. If you haven’t listened to the audio’s yet, what are you waiting for? Check them out at amaudiomedia.com. They would be a great way to pass the time while you are standing in line, waiting to get in. So, if you are going to be in Toronto this weekend, check out Fan Expo. And if you are going to be at Fan Expo, check out the Artists Alley and visit with the amazing guys from Doctor Who Dark Journey and say “hi” for me. Tickets can be bought at the door, check out the Fan Expo website for more details. You know the phrase “better late than never?” Well the awesome guys behind Doctor Who Dark Journey might have something to say about that phrase because I have been extremely late. Way back at the beginning of the summer I recorded a two part interview with them. The first part has already been posted, in it we talk about the first four episodes of their fan produced Doctor Who audio. But the second interview? It’s lain dormant on a hard drive as the dog days of summer have affected my work habits and work ethic. Well, the time has finally come. Here is part two of the interview in which we talk about what I love about their show (and what I didn’t like), the Master as a stay at home mom, what is coming up in season 2 (spoilers) and more. Capaldi Marco Polo Introduction Debunked? 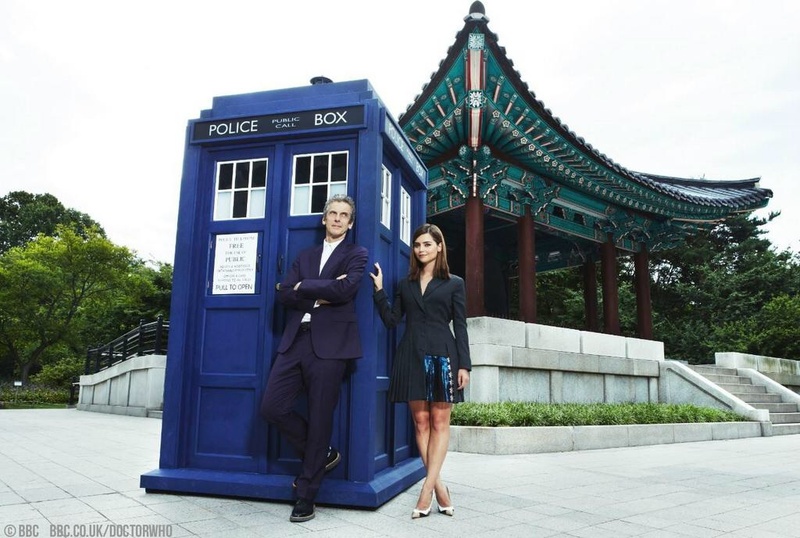 For the last little while there has been this rumour going around that Peter Capaldi and Jenna Coleman have recorded an intro for the missing story Marco Polo. The scene features the pair of them in front of a blackboard full of writing (now released as a promotional shot, though at the time of the rumour it hadn’t been publicly released) with both in character, the Doctor explaining to Clara and the audience about who Marco Polo was. The idea behind it being that an introduction featuring the Doctor might entice new series and younger viewers to purchase the story. Then the rumour exploded with more details, Tennant and Smith had recorded intros together and separately, Dan Starkey had recorded an intro as Strax. A couple hours later those with sources back tracked on their info and said it was all for the new series. Well, most of it. The consensus remained that an intro for Marco had been recorded. And I immediately thought that this would be the perfect explanation for the blackboard and whatever scene was recorded. Maybe something in the new series will tie into Marco? It makes more sense to me than it being an intro to a previously missing story. I guess only time will tell though. Stay tuned, we only have to wait 12 weeks to know if that ‘Marco intro’ was for one of this Extra segments. Casual viewers will enjoy the fun, fast pace and lighter side of Doctor Who Extra but there’s plenty for fans, too, as we take a quick dip into the archive for every edition, reflecting on how Doctor Who’s history is echoed in this current series. It sounds pretty awesome to me. I can’t wait to see how/if they tie any of the new episodes in with classic series episodes! On the other hand, the Radio Times has an editorial regarding the length of Doctor Who: Extra. However good it might be and sources close to the show assure me the team have spent a great deal of time and effort getting it right – it still won’t be the full-fat Confidential-style show that fans crave (and that was voted the best ever BBC3 show in a 2011 RadioTimes.com poll). Did you know that Stuart Milne reviews stuff? If you’ve ever been to his blog (appropriately titled Stuart Reviews Stuff) you would indeed have known that. Recently Stuart collected all of his Doctor Who reviews from the entire classic era and put them out as an e-book. I had a chance to talk to the opinionated man about his book and Doctor Who. Troughton Is My Doctor: Your blog Stuart Reviews Stuff has been around for a few years now, how did you get started reviewing stuff? Stuart Milne: At the end of each year, you always see these “Best of” review type articles and TV shows. I found that when I looked back on the movies I’d been to at the end of the year, I’d draw a blank on the ones I saw between about January and March. So I decided to start writing down my reviews of the movies I’d been to based on that. Initially it was just something to share with my friends as we tend to have wildly differing ideas on what makes a good film. But one day after I wrote an article on the Doctor Who audio, The Holy Terror, I noticed my readership suddenly spiked, and since I was about to start watching Doctor Who from the start again, it seemed like an fun thing to do. People were interested in reading my thoughts on it, and I was happy to share those thoughts. SM: Absolutely. I knew from quite early on that an ebook would be my ultimate goal. It’s not that I wanted to make a load of money from them – if I had then I wouldn’t have put them up on the blog as I wrote them – but I just thought it’d be a nice achievement to look back on. I’m proud of it. TIMD: What’s your favourite Doctor Who story? SM: Now that would be telling. I have my own rankings of all the Doctor Who stories that will be released in my second book. TIMD: Fair enough, but let me ask you this, was your favourite story also your favourite to review? Or did you have another review (even though it might not be your favourite story) become your favourite to write? SM: A large part of the reason for me wanting to actually review Doctor Who was that I felt certain stories have been badly maligned by the received wisdom of fandom. The likes of the Keys of Marinus, Revenge of the Cybermen and The Underwater Menace all get rough treatment from fans of the show, mainly because it’s the done thing to be critical of them. The biggest example of that for me was The Gunfighters, which is a story I absolutely adore. TIMD: Well we agree about that, I think The Gunfighters is a riot! SM: When I got round to reviewing that, my aim was to show how ridiculous fan views of it were. At the time, I found reviews of it on Amazon that said stuff like “I enjoyed watching this, but I know it’s a bad story so I’ll give it 2 stars”. That doesn’t even begin to make sense. So I feel I got my love of the story across, and what’s more, the nature of that review shaped the format for all the other ones I’d write in the future. TIMD: Do you have a favourite Doctor or era in the shows history? SM: Again, I don’t want to give much away in terms of my overall rankings of the stories, but here are some statistics for you…In the 1960s, there were 50 stories. Of those 50, only 4 rank in the Bottom #50 of my rankings, with 18 featuring in my Top #50. Compare that to the 1980s, which conveniently also had 50 stories in it. Of those 50, a massive 20 feature in the Bottom #50 and a paltry 3 feature in the Top #50. So I think it’s clear that the 60s was a better time for the show than the 80s. TIMD: On your website you review of Enemy Of The World and Web Of Fear after seeing the newly recovered episodes and compare your new opinion to what you thought before, going on just the reconstructions and surviving episodes. How awesome was it to really see those stories for the first time? SM: It was fantastic. Literally, it was a dream come true. I remember loading up the trailer of the Web of Fear and just thinking “This is a….mazing” when the “new” footage appeared. I’ve been holding out hope for missing episodes to be returned since I was about 6 years old in the 1980s, when I read about the missing stories in the 25th Anniversary book. These are exciting times to be a Doctor Who fan. TIMD: How do you think future recoveries will impact the opinions we have of missing stories? SM: It depends on the story, I suppose. If there’s a lot of existing footage/pictures from the story, then that won’t have as much of an impact as one where the footage doesn’t exist. Web of Fear is a great example of that. We knew most of the sets from Episode One, and a lot of the story was just the characters talking in those same sets. So I don’t think many people’s opinions were changed. It would be the same if episodes of The Moonbase, The Invasion, The Crusade or the Reign of Terror showed up. Enemy of the World was a completely different situation though. We only had the sets from Episode 3 to go on, so everything about the other five episodes felt new, fresh and interesting. And moreover, scenes like Salamander smoking his cigar and going down to the bunker were completely lost to any reconstruction. TIMD: What about one story that, if seen in full, would change fandom’s opinion of it for the worse? One for the better? SM: I think people assume Fury from the Deep is a better story than it actually is. People talk about it like it’s one of the all time classics, but I wonder whether they’ve actually watched the reconstruction. For me, it seems as though it’s six episodes of people having a conversation at a gas plant. And – and I could be wrong about this – the most iconic moments still exist in the form of the censor cuts. Similarly, I’ve never understood why fandom desires the return of the Tenth Planet episode 4. The only bit that matters still exists. The other 23 minutes are just an extension of a boring story. As for one for the better, I think that there are some stories that fly under the radar with people being indifferent to them because they’ve got nothing to go on. I reckon stories like The Savages, The Smugglers, The Highlanders and The Myth Makers would be held in higher regard if they were to be seen in full. TIMD: Is there a story that you would like to see more than all the rest? SM: It’s got to be either the Myth Makers or Marco Polo for me. SM: Absolutely. In Book Two, I deal with the Modern Era of the show, from the Christopher Eccleston Era onwards. Like I said earlier, that book is the one that ranks all the stories from worst to best, so anyone who had read any of my reviews should buy that one. TIMD: When can we expect that to be released? SM: Well in theory, I could release that tomorrow if I wanted to, but seeing as we’re under a week away from the Peter Capaldi season beginning, I might well hold off until that has finished and include his stories in the book and the rankings too. TIMD: So what do you think of Capaldi? SM: I’ve not seen any of his episodes yet, even though I know there have been leaks. Call me a traditionalist, but I’d rather watch it on TV in its proper intended quality than watch dodgy screeners. But without having seen him, I’m still very excited about it. Capaldi is great in everything he’s appeared in, and I’d like to think Doctor Who will be no exception. TIMD: Where can fans find your e-book? SM: You can find my book over on Amazon. I hope you enjoy it, even if you don’t agree with my thoughts on your own favourite story. Thanks Stuart for taking the time to talk to us, and good luck. Can’t wait to hear what he thinks of Series 8! If you want to stay in touch with all things Stuart Milne, you can follow him on twitter @SGMilne , check out his blog and don’t forget about that book!